Can I share my account with my spouse, children, or friends? If you have an Unlimited account subscription, you may have up to three additional people sharing your storage space and Unlimited plan benefits. Will other account members see my videos, pictures, or account information? Each person you invite to your family account will have their own separate login; you will not be able to see each other's photos, videos, or Stories unless you choose to share them as you would with anyone else. Also, account members will not be able to see or make changes to your account information (including your billing information). 1. 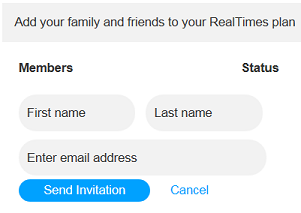 On the RealTimes website, go to Account Settings (https://realtimes.real.com/myaccount). 2. 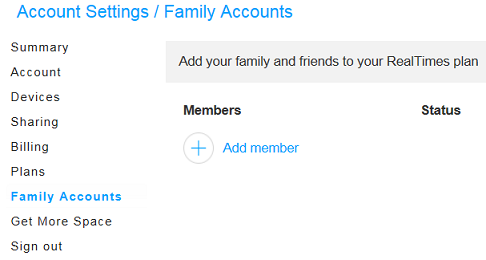 Click the Family Accounts link on the left. 4. Enter the name and email address of the person you wish to add, and click Send Invitation. That person will receive an email with a link they can click to accept your invitation. In your account, you will see "Invitation Sent" next to their name while the invitation is pending; once they've accepted, their status changes to "Active." What if I want to remove them from my account? 3. Click the Remove link next to the member's name and status. They will be immediately removed from your account. No notification is sent to them, so you may want to let them know that their account status is changing.